The Hurt Locker winning this year's Oscar for best picture is a sad statement of how low the award has sunk in terms of being a stamp of quality. Don't believe me? Well take a look at this great war epic that also won Oscars in it's time. 7 of 'em! 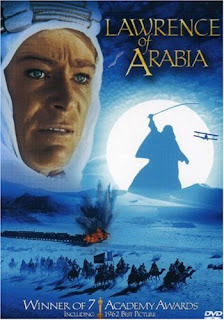 Lawrence of Arabia is of course very well known, but still much overlooked by anyone who wasn't yet born at the time it was made. And a lot of these people seem to be under the misconceptions that "Old movies are boring," or "The effects are bad," "They look crappy," or even "The music is annoying!" This film will change your mind about all that. And that's even though it actually lasts for more than 3 hours! If you think films like Lord of the Rings, Gladiator, Braveheart and Troy have great battle scenes, you ain't seen nothing. This is where it's at. And even better: Here it's all real! Yeah! There's no CGI or duplication of a small bunch of warriors to make it look like a big army here. When they wanted a few thousand people to charge at each other and scream like they were possessed, they actually got a few thousand people to do just that. There's also a director's cut which has an additional 20 or so minutes. I highly recommend seeking it out, and can even put it up here, if there's any interest. But for now I just linked the regular "short" 3hours 22minutes version.